These real restaurant Breakfast Recipes will get your day started off right! These favorite breakfast restaurant recipes range from hearty, full-family fare to "get-it-and-go." All are delicious, and nutritious. But many items can be quickly and easily made ahead of time and served the next day ...or several days after ...without a loss of quality! 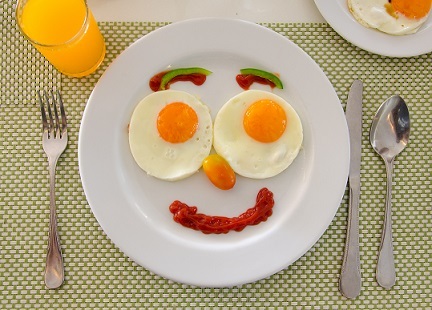 You've probably "surfed" onto this website wanting or needing some proven breakfast recipes. That's great because you've found them! This website has great restaurant recipes. If you want the recipes in e-book form or in a beautiful color paperback book, just click here. All these recipes are restaurant customer-tested and customer-approved. They work! Have a group coming for breakfast or brunch and need to serve scrambled eggs? Here is how to cook and hold the eggs so they are still hot and delicious when dishing up. Preparation time: 10 minutes. Serves 6. Memories are waiting to be made with this scrambled egg recipe using smoked wild salmon. I am fortunate to live in Washington State (USA) because of the variety of quality products available. 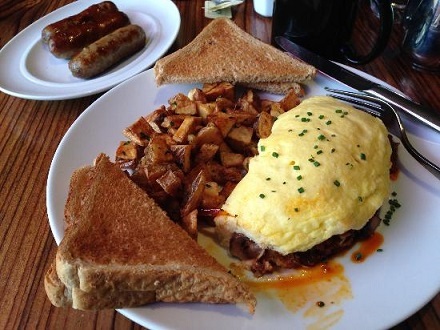 This is an easy restaurant breakfast recipe but the "key" is using quality smoked salmon. Preparation time: 5 minutes. Serves 4. This is one of the best and most famous American omelet. If it is scrambled and placed between slices of toast it becomes a Denver sandwich and is equally as good. Preparation Time: 8 minutes. Servings: 2. I like to have fun naming some of my restaurant recipes! This is a recipe for a delicious sausage omelet. Preparation time: 12 minutes. Serves 1-2. 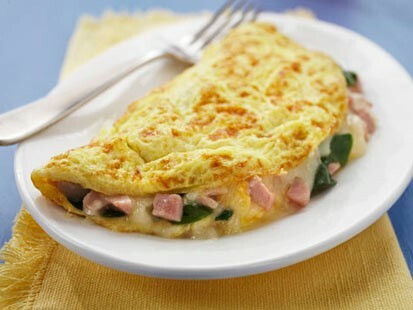 This delicious omelet is a low fat chicken omelet primarily because the omelet is made only with egg whites (no yolks). Preparation time: 10 minutes. Servings: 1-2. A huge selling omelet at my restaurant when I run it as a special. The restaurant recipe calls for bay shrimp with fresh avocado. Preparation time: 8 minutes. Serves 1-2. Make this recipe ahead of time. Serve the next day when you think you’ll be pressed for time. 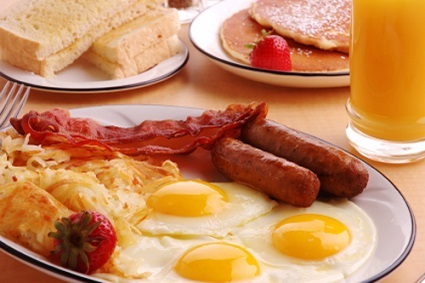 Great restaurant style breakfast recipe and buffet item! Preparation time: About 40 minutes. Recipe serves 12. A fresh-from-the-garden restaurant frittata recipe makes a truly delicious and nutritious meal. It is wonderful to live in a farming valley and have easy access to freshly grown, hand-picked, organic vegetables and herbs. I make use of this blessing with this recipe. Preparation time: 25 minutes. Serves 4. Wonderfully delicious combination of Italian sausage, a bit of garlic, marinara or Italian meat sauce and cheese. Preparation time: 12 minutes. Serves 2-4 people. 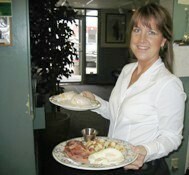 Corned Beef Hash is as much appreciated by my restaurant guests for breakfast as is a dinner of Corned Beef and Cabbage. Preparation time: 10 minutes. Serves 4. One of the most requested breakfast recipes by newspapers as well as customers (guests). There IS a secret to this restaurant recipe. If refrigerated, the batter will keep 5 weeks (cool!) Preparation Time: Approximately 20 minutes. This breakfast recipe will result in 12-16 muffins depending on your pan. YUMMY! Fresh or frozen berries. In a sour cream batter, these delicious muffins may become your Sunday morning extravagance! Preparation time: approximately 20 minutes. 16-20 servings. Make this breakfast recipe ahead and in “bulk.” Serve with one of my “fab” muffins; juice, coffee or tea. You’ve got a delicious, nutritious, fast breakfast! Preparation time: about 20 minutes. 10-12 servings. An unusual but delicious crustless quiche using half an acorn squash with eggs, pork sausage, apples and onions. Preparation time: 25 minutes. Serves 6. Yes, real men do eat quiche and lots of it. This restaurant recipe is a favorite with bacon and Swiss cheese. Preparation time: approximately 25 minutes. Serves 4. An ideal breakfast treat for people who do not care for the more traditional breakfast meats such as bacon, sausage or ham. Preparation time: 30 minutes: Serves 4. This restaurant recipe for Smoked Salmon Quiche I usually feature on a Sunday special sheet. 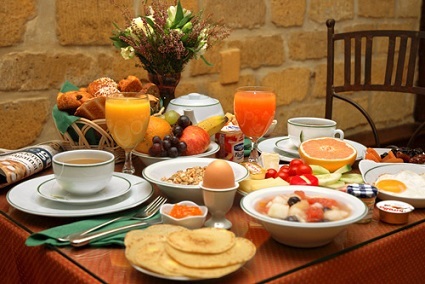 A Best Restaurant Breakfast Recipe. Preparation time: 25 minutes. Serves 4. Believe it or not, I introduced my customers to this breakfast a number of years ago. This recipe now sells like “hotcakes.” My customers also like this frittata recipe for lunch and dinner. Preparation time: 15 minutes. Recipes serves 2. A delicious ham scramble with diced red potatoes, green pepper and red onions, all topped with my wonderful Hollandaise sauce. Preparation time: 8 minutes. Serves 1-2 people. Of course ...the title is because of the spinach and my restaurant guests and I named it what we did for fun (again). Preparation time: 8 minutes. Serves 2 people. We run this on our restaurant special sheet when we have extra cooked potatoes and I call it "grub." It sells very well. I have one other recipe I call "town grub" and it, too, sells out. People seem to relate to the term, but the point is ...they love this restaurant breakfast recipe. So will you. Preparation time is about 15 minutes. Serves 2. Enjoy! A combination of bay shrimp, red cabbage, bok choy, carrots and pea pods make this an unusual, but delicious, scramble. Preparation time: 10 minutes. Serves 1-2. I call this delicious chicken scrambled egg recipe a "Tuscan Chicken Scramble" simply because it contains spinach, basil, tomatoes, garlic and Mozzarella cheese. Preparation time: 10 minutes. Serves 1-2. Okay ...I admit it. I developed my versions of a breakfast sandwich after the “golden arches” introduced them. However, my sandwiches are much better tasting and more nutritious. Preparation time: 8 minutes. Serves 4. We first made this real restaurant frittata recipe for a group brunch at the restaurant. This frittata recipe was a hit! This breakfast recipe is for a sourdough sandwich with scrambled eggs, peppers and mushrooms. You may add a meat choice if desired, but the sandwich is delicious and nutritious without any meat. Preparation time: 8 minutes. Serves 1. 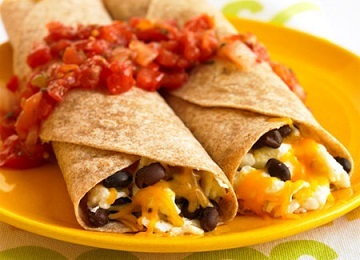 These same ingredients for this breakfast recipe can be used to cook a scramble but I enjoy wrapping them all up in a warm tortilla and having salsa and guacamole served on the side. Preparation Time: 20 minutes. Servings: 1-2. No meat needed for this restaurant breakfast recipe! This delicious breakfast sandwich recipe came to me as a result of the influence of the Southwest and Mexico. Preparation time: 10 minutes. Serves 1. Oh ...yummy! Delicious, moist and tender and absolutely fabulous with a quality maple syrup or fruit topping. Preparation time: 5-10 minutes. Serves: 6 large pancakes. The secret to this "show-stopper" breakfast recipe is the batter. Preparation time: 15 minutes. 6-8 servings. This is an easy French Toast Recipe that my grand daughter eats every time she visits me at the restaurant. But she is not alone. This French Toast "sells like hotcakes!" Preparation time: 30 minutes. Serves: 4 or 16, 2 slices each. Favorite Restaurant Recipe With Children ...and I also found out a lot of adults like this French Toast Recipe with Strawberry Butter, too. Preparation time: 45 minutes. Makes 20 servings but the recipe is easy to scale back. A recipe “two-fer.” Make both. 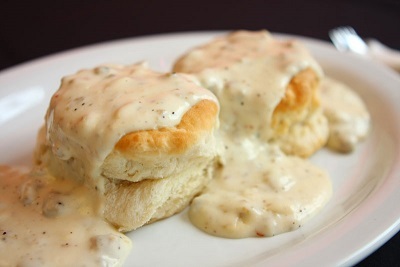 Pour the hot gravy over the biscuits for a treat you will not soon forget! Preparation time: about 25 minutes. 12 servings. Enjoy your breakfast recipes and the company you share them with!